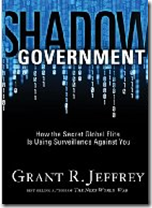 I don’t even know where to begin except to say, “Wow, I didn’t know that.” Shadow Government, by Grant R. Jeffrey, is a book that will have you calling all of your friends to let them know what you are reading. Also, you will call your spouse and tell them to make sure they are careful when emailing, calling, texting, or simply talking on the phone –because you never know who is listening. Shadow Government takes you deep into the world of surveillance cameras, financial transactions and RFID chips hidden in the stuff you buy –so companies can track who bought it and what was bought. Sound like something out of a movie? That’s what I thought too, but boy was I naive. Grant R. Jeffrey not only details –and I do mean details— how phones, security cameras and computers are used to track us, but what the implications are for the future. I can safely say I have altered how and what I say online since reading this book. This book needs to be read; not because it will scare anyone in thinking they are being watched 24/7 –which isn’t far from the truth some places on earth—but because understanding where technology is today will help all of us make smart choices about how we communicate and how we purchase goods and services. Also, after reading this book, it will be easier to understand how the Anti-Christ can one day police an entire planet at one time. That got your attention didn’t it? You can purchase this book at Random House by clicking here.